Less than half an hour by plane or two hours by ferry will get you to Carriacou and Petite Martinique, the two picturesque sister islands of Grenada. Here you can find yourself in an authentic, Caribbean experience on a small island with a population of around 6,000 people, earning their living with fishing, livestock, farming, fishing, and tourism. Carriacou and Petite Martinique also boast some of the most beautiful coral reefs and Carriacou –the larger island of the two– is also known as the ‘Land of Reefs’, with shallow clear waters and abundant marine life. 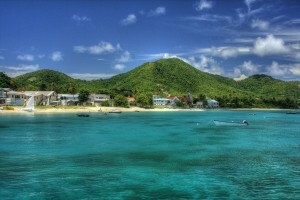 Carriacou and Petite Martinique boast the most beautiful coral reefs and Carriacou –the larger island of the two– is appropriately known as the ‘Land of Reefs’, with shallow clear waters and abundant marine life. Apart from diving, the reefs are also ideal for snorkeling. It’s a small island, so hanging out and enjoying the beach and ocean are the main attractions. Furthermore there is also Carriacou’s Oyster Bed Mangrove: a marine protected area with lush mangroves, vibrant marine life and the lots of nature. Carriacou is a small island and has approximately 3 to 4 dive centers.